While Mission of Burma is best known for their song “That’s When I Reach For My Revolver”, it was someone else version of that song that finally exposed the band to a larger audience. Moby version of that song (and a video) became an MTV staple in the mid 90s (long after the band went on indefinite hiatus), although Moby had to change song title in order to make it safe for MTV play (which caused some outrage among rock fans). R.E.M. also did a cover of “Academy Fight Song”, although it never appeared on any of their official releases. Mission of Burma debuted in 1979 and the first song that they wrote was “Nu Disco”, which, as Miller felt, could soon better with tape loop. He contacted Martin Swope, who was a tape manipulator, inspired by the likes of Stockhausen and Cage. Soon, Swope joined the band as a sound engineer and tape-effect artist. 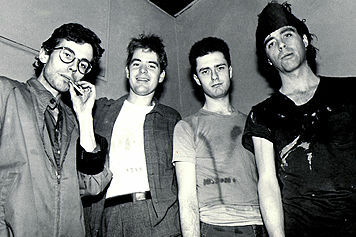 After Mission of Burma’s breakup, band members went on to play with a number of other bands – Miller and Swope were in Birdsongs Of The Mezozoic (although both of them left the band eventuall), while Prescott played with Volcano Suns, Kustomized and Peer Group. Conley dropped out of music business, but returned with his band Consonant, which also includes members of Bedhead and Codeine. Pages tagged "mission of burma"